Since Felix was introduced to Chicka Chicka Boom Boom he has become absolutely fascinated with letters. One day, about 2 weeks ago, we were playing and he randomly pointed to a letter and said "Y". It was the letter y and that marked the beginning of this learning explosion that is keeping me on my toes and sending me to bed absolutely exhausted at night! So that is what we are doing. The picture above shows the collection of letters we have for each group. We had the Eric Carle Animal Flash Cards already. The top right is the Leap Frog Fridge Phonics toy. I don't have a link to it because it is so difficult to buy online here in New Zealand for a reasonable price. I ended up contacting Leap Frog NZ directly; they said they're exclusive to Farmer's now but they sourced one to sell me. It is a great toy, slightly grating, but both boys love it. 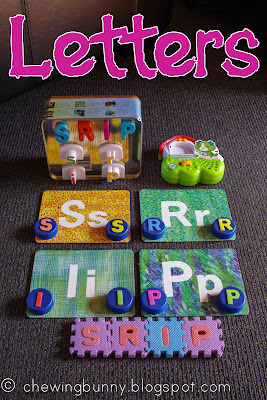 The round blue letters are milk bottle lids with foam letters from the $2 shop stuck on them! The mini foam inter-locking letters and the other fridge magnets are also from the $2 shop. I introduced the letters to Felix using the principals of the Montessori 3 Period Lesson. The link has a great description of the lesson. It's a very simple process, one that you probably use already without even realising. Once he knew the 4 letters in the first group I got him to lay out the 4 flash cards. Then I would pass him a random letter and he would name it and place it on the appropriate flash card. Once Felix reliably knew the first set of letters, I put them aside and introduced the second set. Once he knew the second set well, I combined the first and second set to offer a bit more of a challenge. I don't have all the letters out at one time as I find Felix is happier when activities have a set start and end point. I might choose one set of bottle tops and one set of magnets to use with the flash cards. Once he has them matched, it all gets tidied away, unless he wants to explore more. When we combined the first two sets of letters I would just have one set of letters to match with the flash cards or to match with another set i.e. the bottle tops with the foam letters. This keeps Felix from getting bored with the activity and means it never becomes a chore. I am aware that 27 months is relatively early to be working on learning letters but I'm following Felix's lead. The letters live in an easily accessible spot and they stay there until Felix asks to play. That way it always stays fun and there is never any pressure involved. We are currently starting the third set of letters though Felix has inadvertently learned J, K, V, X, Y and Z just from reading and questioning! I have a number of letter related activities I'm hoping to share with you all soon. At the moment Felix is mastering them faster than I can create, my poor brain. Please remember, this is just one way of introducing letters. I'm sure there are a hundred other and better ways, but this is something simple that is working for us. I am not a qualified teacher, just a Mum, winging it!! Always take the lead from your child, go at their pace and do those activities that suit the stage your child is at. Most importantly, make sure you're both always having fun, if you're not, put it away and go bounce on a trampoline together instead.